Tablets for every taste (from left): Asus Eee Pad Transformer TF101, Samsung Galaxy Tab 10.1, Acer Iconia Tab A500, Motorola Xoom, Apple iPad 2, Samsung Galaxy Tab Wi-Fi, T-Mobile G-Slate, and RIM BlackBerry PlayBook. Photograph by Robert Cardin. This year shapes up as the year of the tablet--for real, this time--as the hugely popular, impressively svelte Apple iPad 2 competes with an array of challengers, most of them running Android. For this article, I test-drove ten tablets: the Acer Iconia Tab A500, the Apple iPad 2, the Asus Eee Pad Transformer TF101, the Dell Streak 7, the HTC Flyer, the Motorola Xoom, the RIM BlackBerry PlayBook, the Samsung 7-inch Galaxy Tab Wi-Fi, the Samsung Galaxy Tab 10.1, and the T-Mobile G-Slate. Most use Google's Android 3.x Honeycomb operating system; but the Streak 7 and the 7-inch Galaxy Tab rely on Android 2.2, and the Flyer uses Android 2.3. Apple and RIM each have their own proprietary mobile OSs. Still more slates are on the way: Android 3.1 tablets from Lenovo and Toshiba, and HP's WebOS-based TouchPad, did not ship in time for us to include them in this roundup. For creating content, An­­droid Honeycomb models--especially those equipped with memory card slots for expanding storage, and USB ports for adding peripherals and USB mass storage--are very strong. For consuming content, including apps, Ap­­ple's iOS platform remains king, with 90,000 tablet-­optimized apps to date. None of the tablets I auditioned hit every mark. Overall, the Galaxy Tab 10.1 and the iPad 2 received matching four-star ratings. For now, the iPad 2 retains a slim lead, thanks to its display's more-natural colors and its vast selection of reasonably easy-to-find tablet-specific apps. Several other units offer unique features: The Eee Pad Transformer has a keyboard dock that transforms the tablet into a netbook; the Xoom supports a software upgrade to 4G LTE; the G-Slate captures 3D video; and the Iconia has a full-size USB A port. But all four stumbled on display quality--and primarily for that reason, the Iconia misses our Top 5 list (see the chart at left) altogether. With a slimmer profile and less heft than the first iPad, the iPad 2 is an evolutionary upgrade. The iPad 2 comes in 36 variants with different capacities (16GB, 32GB, or 64GB), bezel colors (black or white), and Wi-Fi-only and 3G (AT&T or Verizon) versions. Prices start at $499, and jump by $100 for each increase in capacity; mobile broadband costs $130 extra. At 0.34 inch deep, it's one of the thinnest tablets available. Tapered edges make its profile appear even more svelte, and it's easy to hold. Weighing 1.33 pounds, the Wi-Fi version is the second-lightest 10-inch tablet (to the Galaxy Tab 10.1). The iPad 2's bright 9.7-inch screen produces balanced, accurate colors, but its 1024-by-768-pixel display could be even sharper. The iPad 2's simple interface is superb, and its vast array of apps tailored for tablet use helps it remain at the top of our rankings. The Samsung Galaxy Tab 10.1 Wi-Fi is the first Android tablet to mount an effective challenge to Apple's iPad 2 in the area where Apple does best: design. The Tab 10.1 parlays its de­­sign and its Android 3.1 operating system into a tablet that vaults to the head of the Android pack. The Tab comes in two colors (white or gray) and two ca­­pacities (16GB for $499 or 32GB for $599); a Verizon 4G LTE version should arrive by the time you read this. The Tab 10.1 is 0.34 inch thick--nominally the same as the iPad 2, but actually 0.2mm thinner. It weighs 1.25 pounds, 0.8 pound less than the iPad 2. The Tab 10.1 also feels very well balanced, making it comfortable to hold in one hand or two. The first Honeycomb tablet to ship with Android 3.1 installed, the Tab 10.1 benefits from all of 3.1's enhancements (better image rendering, resizable widgets, some interface tweaks, and greater stability among them). Samsung also includes Google's Android Movie Maker and Quickoffice with the tablet, but surprisingly Adobe Flash is not preinstalled. Like other Android tablets in our Top 5, the Tab 10.1 is an Nvidia Tegra 2 system, with a dual-core 1GHz CPU and 1GB of memory. Sadly, you get no ports on-board beyond the docking port; instead, you must buy $30 dongles to add HDMI, USB, or SD Card functionality. Tablet or netbook? 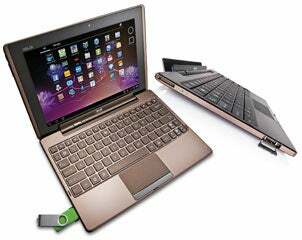 The Asus Eee Pad Transformer TF101 locks into the Mobile Docking Station to create a clamshell setup with a battery, an SD Card slot, and two USB ports. Photograph by Robert Cardin. At $399 for a 16GB Wi-Fi model (or $499 for a 32GB Wi-Fi model), the Transformer is the least expensive Android 3.0 tablet yet. Asus's unique $149 Mo­­bile Docking Station option turns the tablet into a keyboard-equipped laptop. The Transformer's 10.1-inch display dominates its front face, while an array of buttons, ports, and slots are distributed along the edges. It weighs 1.5 pounds. Measuring 10.7 by 6.9 by 0.5 inches, the Transformer is 1.2 inches longer than the Apple iPad 2, a bit of extra length that allows the Transformer to connect to the Mobile Docking Station and create a clamshell laptop. The snap-on docking station approach is a design coup: It provides unmatched convenience and portability. Even better, the 1.41-pound Mobile Docking Station adds an extra battery, a keyboard that's 92 percent of full size, a touchpad, two USB 2.0 ports, and an SD Card slot. The Transformer has the same Tegra 2-based guts as other Android tablets here. It ships with Android 3.0.1, but has an over-the-air up­­grade to 3.1. Asus tweaked the native Honeycomb interface in minor but welcome ways (improved left-nav softkeys! custom keyboard with bright, clear letters and a number row!) and provided file-management customization for handling USB media. Flash isn't preinstalled, but you'll find a link that points to the app in Android Market. I didn't like the noticeable flex of the textured plastic back or the minute gaps be­­tween the metal frame and the scratch-resistant Corning Gorilla Glass screen. But the port and button locations are well executed. On board you'll find a Mini HDMI port and a MicroSDHC card slot. The IPS display looked great in most situations, with a wide angle of view, but our test photos' colors appeared way off. Still, if you plan to use your tablet mainly for productivity, the Mobile Docking Station makes the Transformer a fine choice. The first An­­droid Honeycomb tablet to launch, the Xoom ($599 for the Wi-Fi version or $800 with a Verizon contract) has held its own against later models, staying in the mix. Verizon hasn't announced pricing for its LTE upgrade, but at least it is upgradable if you buy the Verizon version. Still to come: support for the MicroSDHC slot. With the Android 3.1 up­­date, the Xoom delivers consistently good-looking images, though colors tend a tad toward blue. You'll have to install Flash on your own, though. The Xoom runs on the same Nvidia Tegra 2 platform as the other Android tablets here. At 1.6 pounds, it's the heaviest model in our Top 5, too heavy for comfortable one-handed use. The Xoom is optimized for landscape use. The power button is at back (alongside the 5-megapixel camera); along the bottom are Micro-USB and Mini HDMI ports. T-Mobile's 8.9-inch-diagonal G-Slate splits the difference between netbook-size slates and the tablet models that feel like oversize phones. The G-Slate's big differentiator be­­sides its size is that it has twin cameras for 3D video capture. The G-Slate's di­­mensions are modest (9.6 by 5.9 by 0.5 inches), yet it provides a pleasing amount of screen real estate. The contoured sides make holding the tablet easy, but it felt thicker and heavier (at 1.37 pounds) than I would have liked. Two speakers run along the bottom edge (when the tablet is vertical), and one is at the opposite edge, next to the small power button. So no matter how you hold the G-Slate, you'll get stereo audio. The volume rocker sits at the right side (or top edge) of the tablet. Unfortunately, the speakers' volume is woefully inadequate. Sad to say, the G-Slate lacks a memory card slot for extra storage, and Adobe Flash is not preinstalled (though a link is available). Two 5-megapixel cameras at the back are spaced for recording 720p high-def video in 3D, which you can play back on the display. T-Mobile tosses in a pair of anaglyph glasses for viewing. In my hands-on informal testing, the 3D recording worked well if I recorded my subjects head-on. If you're not recording in 3D, the camcorder captures in 1080p. The G-Slate ($530 after re­­bate and with a two-year T-Mobile contract; $750 sans contract) has ap­­peal­ing features, but it's worth the investment only if you're willing to lock into a contract.